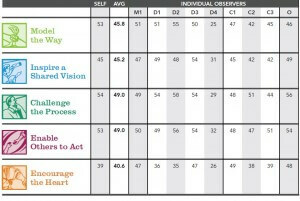 Backed by 25 years of original research and data from over 3 million leaders, The Leadership Challenge® is a leadership development methodology, created by researchers and bestselling authors Jim Kouzes and Barry Posner. Their award-winning best-seller, with over one million copies in print worldwide, describes in detail The Five Practices of Exemplary Leadership®, a proven model for developing more effective leaders. It is supported by the Leadership Practices Inventory® (LPI), a 360° assessment designed to specifically measure The Five Practices. Over three million people have used The Leadership Practices Inventory (LPI) as a first step to reaching their personal leadership best, clearly demonstrating what three decades of ongoing research affirms: that leadership is a practice that can be taught and learned by anyone. Effective leadership is not an inborn skill available to a select few. Rather it is a set of observable behaviors that, with deliberate practice, can help everyone be more effective and make more of a positive difference in the workplace, in the community, in the world. 2) What Does LPI Assessment Measure? Applying the proven principles of the Five Practices of Exemplary Leadership®, LPI enables individuals and organizations to measure their leadership competencies and act on their discoveries. Leaders will gain deep insight into how they see themselves as leaders, how others view them, and what actions they can take to improve their effectiveness. More capability to equip your organization to achieve better results. A clearer, more widely shared vision about your team’s work. Each session of The Leadership Challenge® Workshop consists of a combination of classroom and experiential activities. The sessions include research review, individual and group exercises, videotape case histories and discussion. Walk away with an action workbook and a plan of action so that you can implement your learning the next week from your experience at the leadership challenge. I’m a business and leadership coach that wants you help YOU not only succeed in your business but to become a top leader in your industry. Well, I don’t…but WE do. My clients consider me part of their team and together we work on what it takes to get you to the the top of your game. By offering a number of different types of workshops and/or private coaching sessions we work together to show you where your strengths and weaknesses lie and how to leverage your strengths and improve on your weaknesses.